what a bizarre and fascinating set. Certain powers beyond my control are set to overcome your dark plans to keep everyone awake Julie. Wish I could stick around longer. Clicky star for Chelsea Wolfe. Hi hi hey hey ho ho let's go ! SAVAGES SAVAGES SAVAGES gig of the year ! 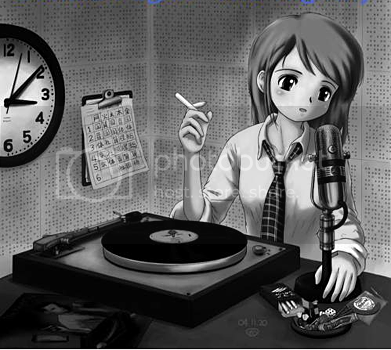 Very noir DJ anime girl -- unique theme for an image. Nice minimalist synth rhythm from Sophia Knapp, reminds me a bit of that very early Human League album. We'll pray and/or hope for the best. @FVH: If I go to a really great show of a really great band, it often will become my own fave contemporary band, until the next such show. Julie is my bathroom clock. I know I need to hurry up when I hear the legal ID! Julie thus serves as an in-band radio signal to activate other upcoming shows along their way. Whoa, Garlands-like cover of the King-Goffin "He Hit Me And It Felt Like A Kiss"!! Amazing idea from Void Vision! Phenomenal gig. And the band worked in perfect sync. Jehnny engaged the front rows (hey that's me) and with flawless backing. But fantastic gig does not equate to conversion. Neil Young. I missed Hausswolff but people said it was excellent. Anyone seen her live ? I was biased, I saw Neil Young because I already like him. Fantastic show, but not enough to make him my fave of the year. Eggzackly. Still tho the best gig I've ever seen. I was about 5 meters from him. I appreciate the older, regional German spelling of "von Hausswolff" -- I've found that my mainly Southwest German ancestors before emigrating to America had spellings like "Hannss" and "Wolff" recorded. And spelling changes when moving to different regions. Good Morning Julie, fred, Matt, and anyone else who's conscious. Just tuned in late, caught the Gary Numan and Void Vision (brilliant.) One look at the playlist and I know I'll be checking out the archive....as I study around the clock at Butler Library @ Columbia U. Grateful for the live "company" right now, though. 5 METERS! !...It was likewise beautiful, almost spiritual, to see an audience of over 5,000 at Washington's Constitution Hall watch in virtually complete silence, as "Heart of Gold" was performed solo by its original composer and singer. That place has great acoustics, incidentally. Preparing for finals? Best of luck! Glad you keep company with DNotS! DNotS rules! K. Karle sounds like Yoko w/more technique...and better English diction. Nice sound from The Soundcarriers. Likewise from The Love Language! Just looked K. Karie up, had a feeling I remembered her name being associated with Cornelius, Wiki confirms he worked on her first albums; they apparently were a romantic item when she was known as a music photog and developing her own act. "Warma Shawarma Dharma"--the grooviest album/philosophy/snack. It's snack ! No, it's a time travel initiative ! No, it's a snack AND a time travel initiative ! this name is probably a translit of "Iða"
Props to the original typist, though! Most of the Norse and even English used to have the ð, I believe it's "th". Its capital is þ, Alt+0254 near the end of the regular ASCII set. Ah, London Waterloo. Nice musical history, if I go back to London I should tour the lovely South West of England; good reason to depart from Waterloo Station. Went to Windsor/Slough from Paddington and walked past Victoria, but should travel on more National Rail next time. "Dead End Street"! One of the Kinks songs that endeared them to the early punks. Instead of cariacatures, boardwalk artists should try drawing anime versions of people passing by--I'd like an anime version of me sometime. don't expect that from Vanessa! "Ms Birkin, come quickly, we are needed." "Troppo"--gone psycho in the tropics! "Poison Arrow"! ABC! This is one of my Livin In Oblivion classics. The Best Show had rec'd this as a good karaoke choice to perform. "Troppo Doppo"--the cure for psycho in the tropics, or the cause? I haven't seen the video for this in decades, but the images reappear automatically when I hear this. Damn you MTV!!! @P90: It makes the sick well and the well sick. Drinking a Doppio, however, is always fine, even in the tropics.. I HAVE TO BE FUN!!! who needs a back announce, I'm playing one more song! Troppio Doppio: The new $6 psychoactive drink at your local Starbucks. There's Syd to play our way out to Meghan on the stream, and JM in the AM on the FM. Thanks Julie for an ever-amazing show! Wasn't Merlin Brawndo the finest thespian in Camelot? @P90: Awesome. Order it with bisthoughti.